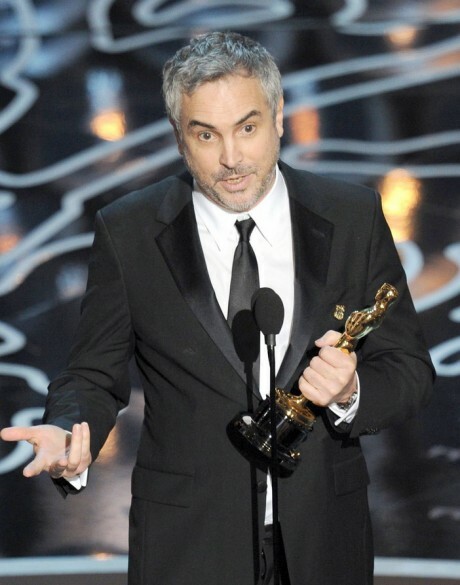 Filmmaker Alfonso Cuarón became the first Latino to win the Academy Award for Best Director and Best Editing in the 86-year history of the Oscars. Cuarón, 52, earned the awards Sunday night at the Oscar ceremony for ‘Gravity,’ a visually stunning survival story in space starring Sandra Bullock and George Clooney. Cuarón was nominated for three Oscars this year. Along with his wins in the Best Director and Best Editing categories (he shared the latter with fellow ‘Gravity’ editor Mark Sanger), he was nominated as a producer in the Best Picture race. Although Cuarón won his first Oscars Sunday night, he is no stranger to the prestigous awards ceremony. He earned his first nomination with his brother Carlos in 2003 for his original screenplay for ‘Y tu mama también’ (Filmmaker Pedro Almodóvar won that year for ‘Talk to Her’). In 2007, Cuarón was nominated with four fellow writers for their adapted screenplay of ‘Children of Men’ (screenwriter William Monahan won that year for ‘The Departed’). He was also nominated with French-born Mexican editor Alex Rodríguez for Best Editing (the award went home that year with Thelma Schoonmaker for ‘The Departed’). In the history of the Oscars, only three other Latino directors have been nominated in the Best Director category. The first was Argentine-born Brazilizan director Héctor Babenco for the 1985 drama ‘Kiss of the Spider Woman’ starring William Hurt and the late Raúl Juliá. Eighteen years later, Brazilian director Fernando Meirelles earned an Oscar nomination for the 2003 drama ‘City of God.’ Then, in 2006, Mexican director Alejandro González Iñárritu picked up a nomination for ‘Babel’ starring Cate Blanchett and Brad Pitt. The next project for Cuarón is the upcoming sci-fi series ‘Believe,’ which he co-created for NBC. The show follows a young girl born with special powers she is unable to control who is protected by a death row inmate-turned-fugitive. Cuarón also wrote and directed the pilot episode, which will air on NBC March 10 at 8 pm CT.